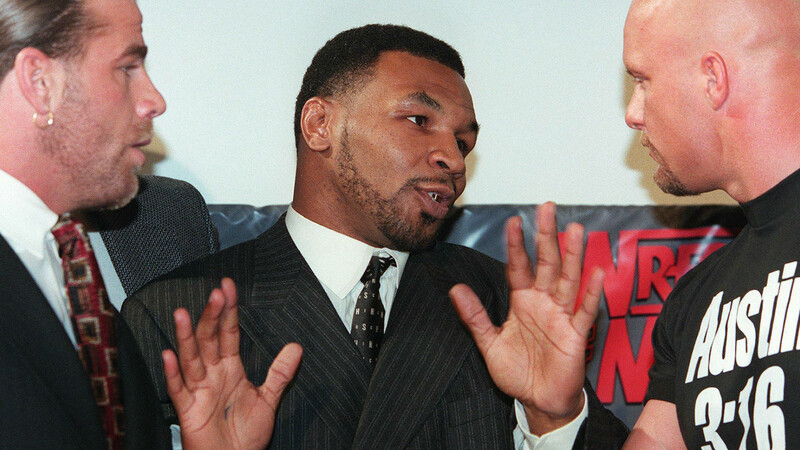 Iron Mike would love to return WrestleMania, 20 years after his last appearance. Mike Tyson is eyeing a return to WWE and ‘Stone Cold’ Steve Austin had better watch his back. The pair enjoyed a short-lived rivalry back in 1998, when Tyson made a series of guest appearances on Monday Night Raw and at WrestleMania XIV. Tyson even served as the “special enforcer” at the flagship WWE pay-per-view event, overseeing a match between Austin and arch-rival Shawn Michaels. Iron Mike’s move into the world of wrestling was global news at the time, helping to significantly boost the profile of WWE in the process. Any Tyson return would therefore be well received, and the boxing legend made no bones about the fact her would relish a return during an interview with WWE presenter Cathy Kelley at the Nickelodeaon Kids’ Choice Awards. Tyson, who also returned to serve as a guest host for an episode of Raw back in 2010, would no doubt be eager to renew his rivalry with Austin. Austin might want to be careful going up against Tyson though. The boxing legend may have successfully transitioned from sports star to actor and performer, but some habits die hard. During filming on one of his most recent movie efforts, Kickboxer Retaliation, Tyson ended up punching one of his co-stars for real during a stunt fight sequence. Go up against Iron Mike in the wrestling ring and Austin could suffer a similar fate. Alternatively, Vince McMahon might be tempted to resurrect one hair-brained idea he previously floated to Kevin Nash: a proper, actual, fight with Tyson. Rather him than us.